Innovation! I'm loving this new camera - read up on the details below, via YankoDesign. 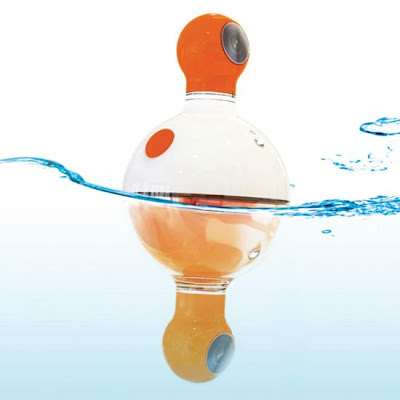 UNDERABOVE is a dual-lens buoy-style camera that can take pictures of the underwater happenings and above the water happening, at the same time. The idea is to experiment and add more dimensions of picture taking while at sea. The clever design incorporates air in the top-half of the body and water in the lower half, to help it stay afloat. An LCD screen gives you a quick preview of the shots taken, and a timer facilitates self-portraits as well. The symmetrical camera body is made with polypropylene, which has a lighter weight than seawater and floats easily.